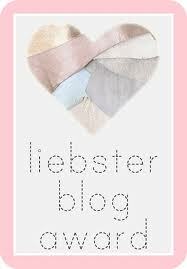 Thanks to Rebecca from Love at First Book for nominating me for a Liebster...you're a dollface! I think I may have been nominated for something along these lines when I first started my blog but I'm too lazy to look so you'll just have to take my word for it. I'm a mom of 3 and an aunt of 3. Least favorite book: I don't finish books that I don't like! Biggest vice: Is coffee a vice? Is chocolate? Biggest virtue: Aw jeez, I don't wanna toot my own horn. Humble! I'm humble! Ha! The exotic pet you’d love to be: That I'd love to be? A monkey! The last book you LOVED? Did you grow up in a small town or a big city? Book buyer? Library patron? Combination? Movie you could watch over and over? A book blog that others might not know about? Ohh the thing that surprised me most is about homeschooling. In my country this is quite extrange, is it too in America? I think it's a fantastic idea, because the schools should be different: they are the same as they were 200 years ago. So well, for me is quite interesting! Homeschooling is becoming more and more popular all the time in America. Most kids go to public schools though. My oldest daughter always went to public. My son did one year of homeschooling but he missed all the girls at the public school so he is back there this year (his first year of high school) My youngest daughter has been homeschooling for a few years now and has no interest in going back to public. Blah blah, hope you don't mind my blabbing on and on, lol. I can't say I know many people whose favourite colour is yellow, that's pretty cool and very positive. Despite not knowing what your mom's cabin is like if you've access to one then I'm not surprised it's your favourite, how awesome. I have to agree with Isi, chocolate is a vice. Chocolate used to be a vice, until that study came out touting the health benefits of dark chocolate. Which, of course, is the only study on the subject to which I pay any attention. Too bad I don't like dark chocolate. Dammit, lol. Thanks! It's cool to know that you're a homeschool mom as well. I'd hang out with you too! Congratulations on the award! That's so exciting. Looking forward to checking out the blogs you nominated, too. Happy holidays!